Just two years ago, 20th Street Elementary was considered such a failing school that the parents moved to take it over from LA Unified using a state law. But Wednesday’s release of state test scores shows the elementary school had the highest math gains of any traditional school in the district. “We have seen a 19 percentage points increase in math scores at 20th Street, it’s more than double proficiency, and it’s the biggest increase in the whole district,” said Joan Sullivan, the CEO of Partnership for Los Angeles Schools, which took over the school last year to help set it in the right direction. The comparisons do not include magnets, span schools, or independent charters because they are not fair comparisons, Sullivan said. In a year, the Concepts & Procedures part of the math exam increased among 20th Street students from 8 percent above standards to 27 percent, and writing skills went from 4 percent above standards to 18 percent. 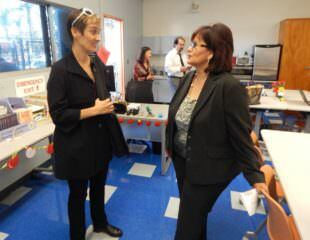 Joan Sullivan and district administrator Rowena Lagrosa at the new parent center at 20th Street. The school’s students showed an incredible leap in math scores as it ranks sixth in the district (excluding magnets) in improvement in English scores, Sullivan said. Garcielita was brought in two years ago after parents moved to use the state’s “parent trigger” law to initiate changes. 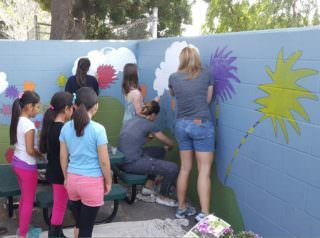 In the past year, he announced changes such as a grant to keep the school’s playground opened on Saturdays and help the school’s library get new books. He said the staff and parents have worked together more than ever to help the school, and the work has paid off. The school opened up a parent center last year with computers to help parents learn how to help their children. Individualized tutoring, professional development for teachers, and a new math program called Eureka Math have also helped 20th Street improve test scores. Sullivan was called in by Superintendent Michelle King to meet with the school’s parents as they sought to take over the school through the “parent trigger” law. Sullivan then met with teachers, students, and parents to explain how the Partnership would work with the existing teachers and principal and change the curriculum. Not a charter, not a magnet, a Partnership school still honors all the union agreements and is still overseen by the district. The Partnership runs 18 schools serving 14,500 students in South Central Los Angeles, Boyle Heights, and Watts and typically takes over the worst-performing schools in the district with a goal to “transform schools and revolutionize school systems to empower all students with a high-quality education.” Sullivan said the Partnership schools will provide support and professional development for the teachers, employ the principal for the whole year (including over summer), and connect the school with other resources to help with technology and teaching programs that are different from the district. “We have the same students, the same teachers, the same parents, the same community, the same neighborhood, and we’re seeing growth now two years running,” Sullivan said. School improvements by parents, teachers, and students at the school. “At 20th Street there was a lot of trepidation about our coming in and we didn’t change a single teacher, and things changed dramatically,” Sullivan said. 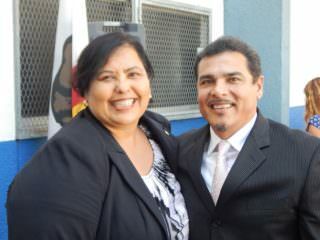 The school faced the threat of a lawsuit and about 200 parents, with the help of Parent Revolution, an LA-based nonprofit group that aids parents. The school also lacked a lot of technology and Partnership helped get computers into the school. “Many of the families did not have access to technology at home, so the parent centers were also important,” Sullivan said.